What you can see below is a glimpse of our – almost – daily breakfast situation during our most recent trip, many new found favorites included. Can you guess, where we’ve been? EDIT: Some of you were right, we’ve been to the Côte d’Azur again … more on the trip is soon to come. Oh it looks divine. Are you in Southern France? Is that fougasse, figs, pissaladiere, palmiers I spy, among those other goodies? Why France of course, the Flan is a dead gieaway ! This is my sort of breakfast! 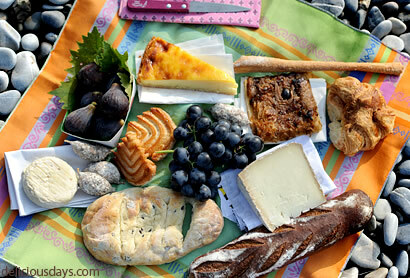 Bread, cheese, sweets, fruit... Are you somewhere in France? somewhere in the Mediterranean. I have never been but the colors and the foods remind me of that side of the world. I was wondering where you have been. das wäre jetzt wohl unfair, wenn ich's verrate........das croissant sieht ja ein bischen 'zerrupft' aus!!!!! it's definitely not a bad location ... provence, i guess ... right? It has to be France! The Fougasse and the palmiers clearly show! Where exactly have you been? I'm with Ciaochowlinda, I think you've been in the south of France or somewhere in France. Looks al lot like my lunch when I visited Portugal (the Lissabon region). But maybe not quite, so I'm guessing... Spain? I second France, this looks like a wonderful picnic with Pissaladiere. Du warst in Südtirol, oder am Gardasee. Nur bei uns gibt es diese guten Dinge auf einem Haufen, die perfekte Verbindung mehrere Esskulturen! If you cooked, it could be everywhere even Munich. You're so great. Das dunkle Baguette läßt mich an Österreich denken. Möglicherweise auch Norditalien. As far as I can see you had a wonderful trip to Corsica. Hi Nicole, I guess, you visited the North of Spain, as I see a piece of Manchego-Cheese, una Ensaimada, un trozo de Pissaladiere, un trozo de Pastel Vasca y unos chorizos de Ternel. And you had breakfast on the bank of a little river? Might be I´m right? I cannot guess, but it looks so delicious. Perhaps France, as others have said? I can certainly see why you would be stuffed! My first guess was Greece until I read all the other comments. They made me doubt myself! Where???? @ eliza: where do you see the ensaimada? I think you've been in Asturias, North of Spain. Fougasse, pissaladière, and the nice beach of Nice? Looks like my lunch in Antibes a couple weeks ago when I too was on the Riviera for vacation. I LOVE Nicoise cuisine. So much great flavours!